Since I created the fonts Chords and Scales some years ago I hoped that Apple would release an update for iOS featuring Drag and Drop for text on the iPad. With the release of iOS 11 Apple introduced quite a few new features the fonts Chords and Scales take advantage of. Drag and Drop for text – that implies the fonts Chords and Scales – is the most useful feature that makes the work with diagrams much easier. First upload the Chords & Scales Library with more than 10000 chord, scale and arpeggio diagrams to your iCloud Drive. Include your custom diagrams as well. Open a new Apple Pages document on your iPad. Then open the Files App introduced with iOS 11. 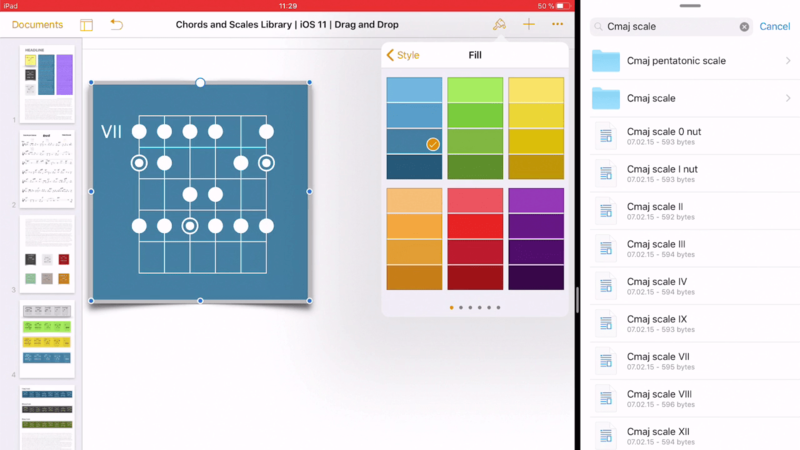 Use Split View mode to drag & drop diagram files from the Chords and Scales Library to the Apple Pages document. Edit the diagrams by applying text styles, resize the diagram by changing the font size, add frames to the diagrams and background color, et cetera. Use apps such as Readdle’s PDF Expert to drag and drop diagrams from your iCloud Drive to a PDF leadsheet as shown in the video.